Apple today updated its lineup of silicone iPhone cases and Apple Watch Sport Bands in three summer colors, including Peach, Marine Green, and Sky Blue. The three new colors are available for both 38 and 42mm Apple Watch Sport Bands, with pricing the same as other Sport Bands ($49). Apple has also released silicone cases for the iPhone X, iPhone 8, and iPhone 8 Plus in the new colors, with the cases also suitable for the iPhone 7 lineup. The new silicone cases are priced at $39 for iPhone X, $39 for iPhone 8 Plus, and $39 for iPhone 8. Apple has not provided leather iPhone cases in new colors, nor has the company introduced iPad cases in the new summer shades. There are also no other new watch bands, with the exception of the Pride watch band. 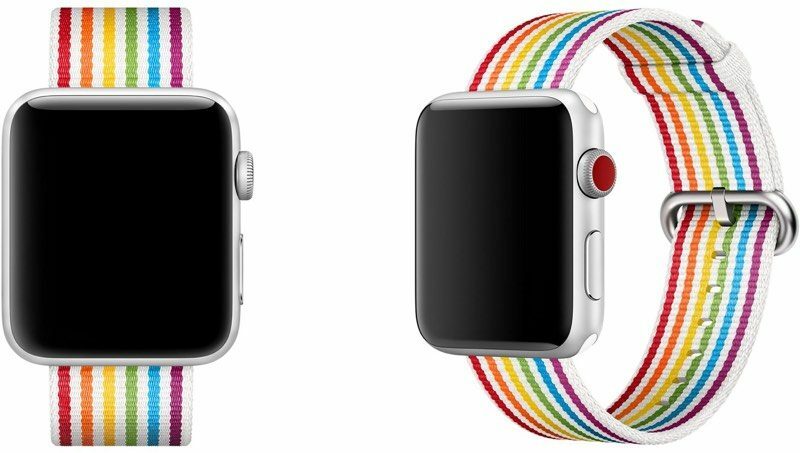 The Pride watch band is a new version of last year’s Pride band, using Apple’s Woven Nylon band in a series of rainbow colors. Apple has also introduced a matching watch face that’s available today in watchOS 4. The Pride watch band is available for $49 and can be ordered starting today.